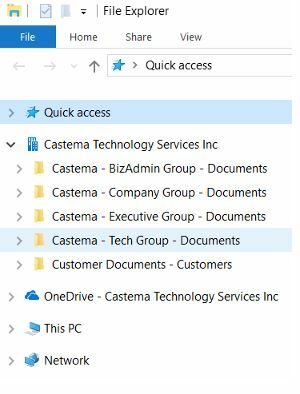 Cloud File Sharing Made Easy | Castema Technology Services, Inc.
Dan Bremner, President, Castema Technology Services, Inc.
We are often asked by clients what cloud app or service we recommend for sharing files, and for most of the companies we work with, the answer is easy: the ones you already have as part of your Office 365 subscription, namely OneDrive for Business and SharePoint. For internal file sharing within your organization, we typically recommend you create a Team in Microsoft Teams, and add members to it. That automatically creates a SharePoint document library that is shared with your Team. For files that are your individual work, rather than shared with a team, use OneDrive for Business, which will let you access those files from multiple devices, and share as needed. Many users are familiar with server shared drives mapped with different drive letters, say S: drive for company-wide Shared files, H: drive for Home/Personal files, and maybe K:, L:, M: and so on for files shared with specific departments. In concept, a user's OneDrive for Business folder replaces that H: home drive (or sometimes U: - User drive). The SharePoint libraries that get created for your Teams can be thought of as replacing those other drive mappings. And with the On-Demand Files feature, it's possible to use file syncing to make all of those cloud-storage locations in ODfB and SharePoint appear in your Windows 10 File Explorer (or Mac Finder) without eating up all the storage on your local drive. The OneDrive mobile app gives access to all those same cloud locations, both OneDrive and SharePoint/Teams sites. As an example, we've just rolled out internally a new expense report process that uses the Scan function in the OneDrive mobile app to snap a photo of a receipt, which automatically crops out the background to just show the receipt, then saves it as a PDF to a Scans folder in your OneDrive. Then when expenses get entered in our ticketing system on the PC, the receipt is right there in the Scans folder and can be attached electronically to the expense. If you'd like to discuss modernizing your file sharing beyond the mapped drives you've used since the 90's, drop me a line and let's talk.